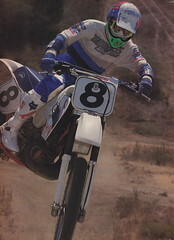 Here is another couple of classics from my personal collection of motocross ads and brochures. This one covers Honda’s awesome 1986 CR lineup. In this year, the red bikes were by far the best bikes in pretty much every class and dominated in the magazines and on the track. Great bikes then and real classics today. I am going to include both the excellent brochure for the full-size CRs and also the iconic magazine ad they ran that year.